What a week folks! In case you haven’t heard, I’ve been nominated again this year for Saveur Magazine’s Best Blog Awards in the cocktail category. A HUGE thanks to everyone who sent in the nomination. Now the voting begins for the winners. You have until April 30th to get that vote in. I super appreciate all of you. Moving on… to cocktails. In an effort to make cocktails taste more like the foods I love, i.e. Thai Food, I’ve been concocting various infusions lately and experimenting with some bizarre flavor combinations (more to come here soon). One of the simplest though was fresh lemongrass. I compare lemongrass as the pastel cousin to winter citrus. While the oranges and grapefruits have this intense zestiness that I feel counteracts the depressing reality that is winter, lemongrass is a good match for the budding warmth of springtime. It’s floral, with some light citrus notes (but basically it’s the same smell as a citronella candle). For this cocktail I’ve also added back in a little bit of zest in the form of limes and lemons (I guess I needed some zestiness to get me through the soul crushing time known as tax season. Why haven’t I scanned any of my 2014 receipts yet?!?!) to make this a take on a sour. Juice + bitters + zest = just the right amount of punchy citrus. I’m using vodka as a neutral base for the lemongrass flavor to shine in the infusion. There are two ways you can go about infusing a lemongrass vodka this weekend depending on how much time you want to spend. The longer, more traditional way, requires nothing but time. You chop and bruise the lemongrass, cover with vodka, and wait about 1 to 2 weeks to extract the full flavor. The second way is quite quick, seriously quick, but requires some equipment. An instantaneous infusion can be made with a whip cream canister and two N2O chargers . Extra equipment, sure, but a very immediate infusion. OK! Let’s welcome in spring with some booze. 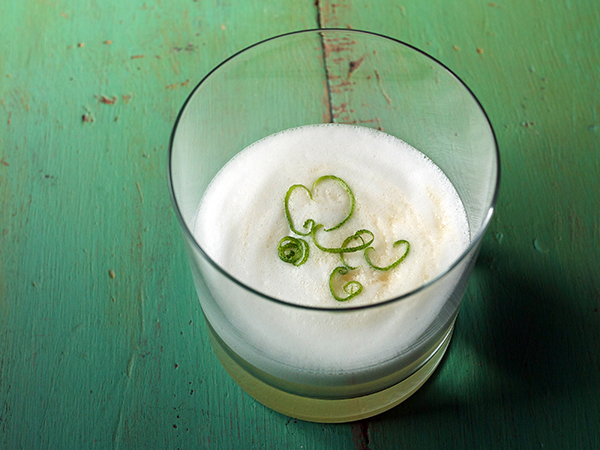 The lemongrass is a more subdued flavor that doesn’t take over the drink or muddle the flavors but provides a subtle floral backdrop to the cocktail. 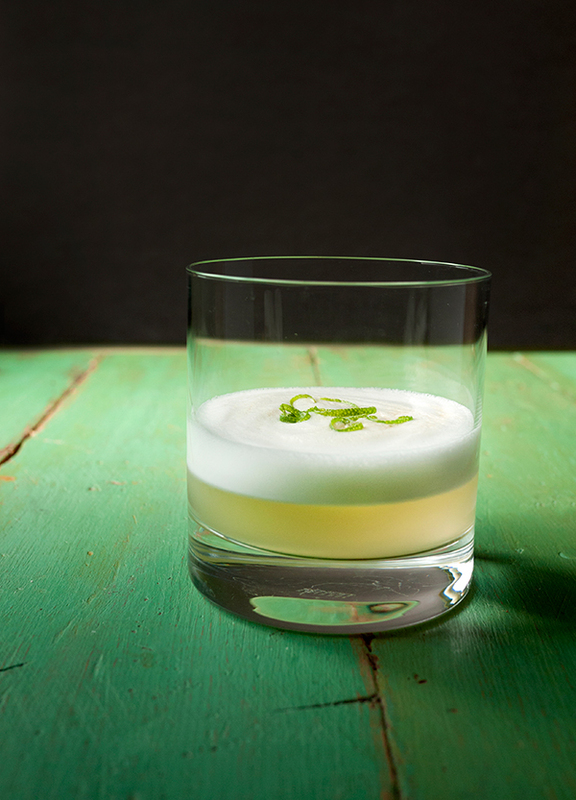 There’s a nice bite from the lime juice and an egg white is added for some extra silky mouthfeel and to add a lightness to the drink. 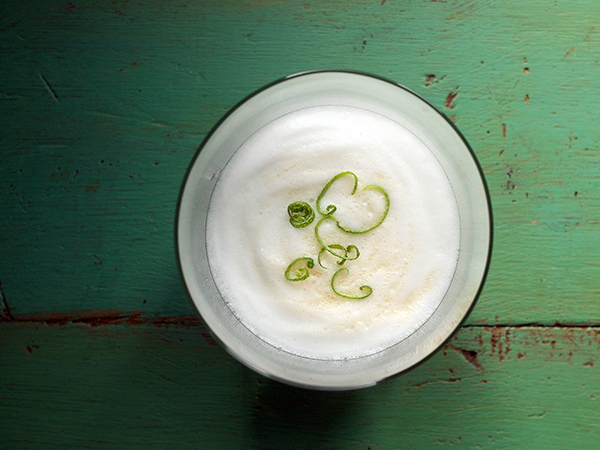 The foamy head created by dry shaking with an egg white suspends the lemon bitters above the cocktail, heightening the heavenly layers of citrus aroma. I created this recipe originally for Serious Eats this week. 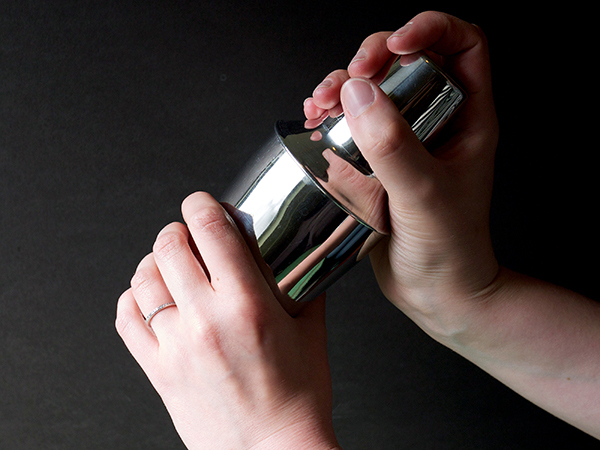 Previous Post: « Monday Booze News: Stir and Strain is a Saveur Finalist!!! This is such amazing news! Congrats!!!! !